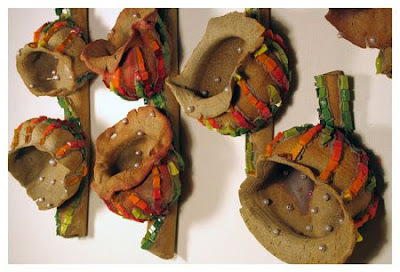 Many moons ago - or what seems like many moons ago - we used to do a lot of art/craft shows. For the most part it was a lot of fun. We had to produce a lot of pieces for our display. It was great to meet and talk to people who were interested in our art. And, on the occasion where we did make a sale, it was satisfying to have people pay real cash for our mosaics. But it was a lot of work and the sales were far and few between. So we pretty much gave up doing the show circuit ... except for one show. We've done this for 4 years now - this will be our 5th. It's held in Provincetown - at the tip of Cape Cod - the Friday and Saturday after Thanksgiving. We've always done well at the show, making enough to pay for a few night's stay in a B&B and a couple of great dinners with a nice bottle of wine. This time of year is great to be in Provincetown. The chaos of the summer is over and the town is settling in for a quiet winter. So the problem is - what do we bring? The crowd that comes to a show like this is looking to buy holiday presents. Something nice but not too expensive. We still have a lot of smaller pieces from the days we did shows - mostly trivets - but nothing which includes our marble and rocks. So we've been making a few things to bring to the show and it's been fun doing some non-serious pieces. Here are four mirrors. 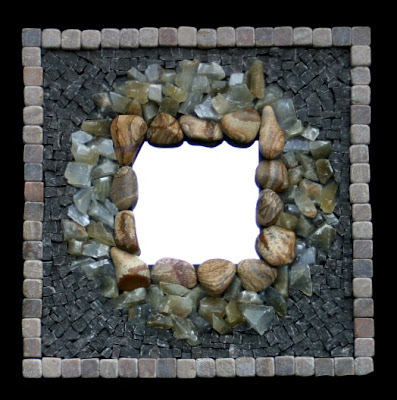 This one uses one of Lynn Moor's mirror frames (http://www.mosaicsmalti.com/). The inner rim includes polished kyanite. 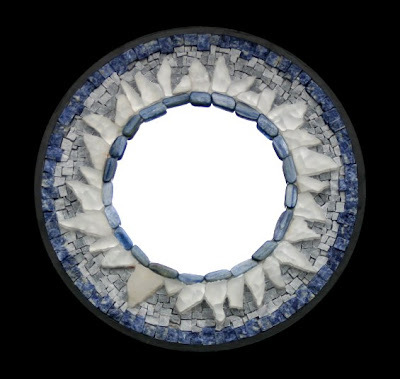 The outer ring is sodalite. And inbetween is satin spar selenite and marble. This one uses one of those inexpensive Ikea frames. The inner ring of stones are pictured rocks. Moving outward - honey calcite, St Laurent marble, and Palace Onyx. This one also uses an Ikea frame. 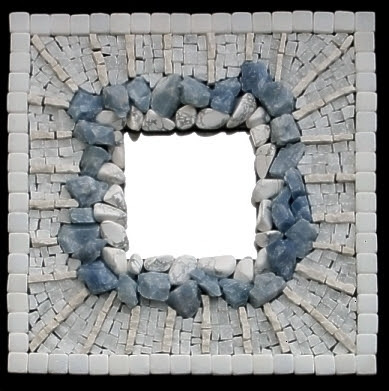 The inner stones are white howlite, followed by blue calcite, brecia sarda and cararra marble, and a border of pure white tiles. This one I like. It looks better in real life than the photo. The inner circle is a combination of Orsoni mosaic gold with Cararra marble. The outer circle is Cafe Pinta and Gray Black marble. The red square is Mosaic Gold and the inner fill is Pure Black marble. Dimock Gallery, 730 21st St. @ H St., Washington, D.C.
straight 2 blocks on 1 St. When we designed the fashionable Mosaic Rocks t-shirt, we weren't expecting that we would change the habits of mosaic artists world wide, but look here. 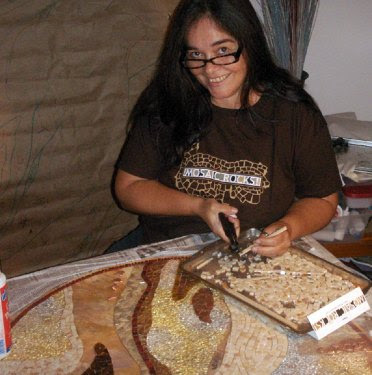 Dianne Sonnenberg has selected a color palette for her latest mosaic, no doubt, to match the colors of the t-shirt. How cool is that? Well ... not really, but it is a happy coincidence. I can't wait to see how the mosaic turns out. The past Saturday was the last day of the exhibition. We had over 150 people come to see the show and attend the artist demonstration. Michael & I did the demonstration. The topic was "various mosaic materials." Previous demonstrations were in a lecture format, so we decided to do something more interactive and get people involved. 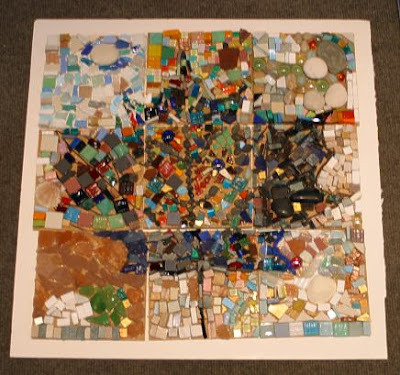 We talked about different materials - glass, ceramic, vitreous tiles, smalti, gold, marble, stone - and then gave people 30 minutes to create a mosaic using these materials. 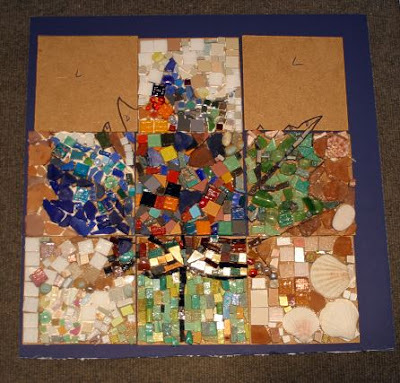 We created a design (a leaf) on a large substrate and cut it into smaller 6" x 6" pieces. 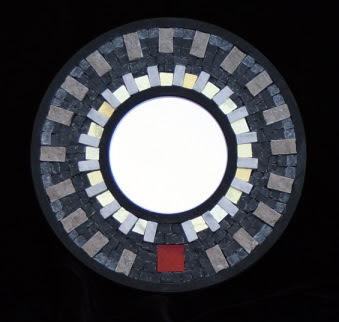 Each piece has part of the design with an L to indicate that light colored tesserae should be used in the space and a D for dark colored tesserae. Most folks had never created a mosaic before. A few were mosaic artists. But all were engaged for 30 minutes gluing all sorts of items on the squares. It may not have been the more "professional" way to introduce people to mosaic making - but everyone had a lot of fun. 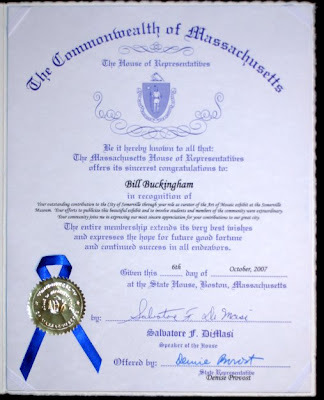 Last night, Margaret Ryan and I were given recognition by the Massachusetts House of Representatives for our work on the Art of Mosaic exhibition. 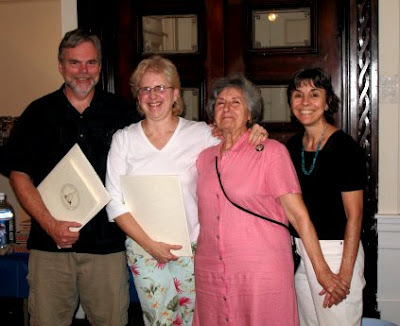 We had a closing party for the artists and friends of the museum in which Denise Provost, the Somerville state representative, presented us with this honor. Your outstanding contribution to the City of Somerville through your role as curator of the Art of Mosaic exhibit at the Somerville Muesum. Your efforts to publicize this beautiful exhibit and to involve students and members of the community were extraordinary. Your community joins me in expressing our most sincere appreciation for your contributions to our great city. and continued success in all endeavors. I made this bench with concrete blocks outside my studio, and decorated it with a mosaic using pebbles at one end, gradually changing to broken tiles, using the same natural colours. In contrast, the red and yellow tiles, show a large diamond python (carpet snake) which had swallowed a small animal and hung around the studio while we were renovating it. 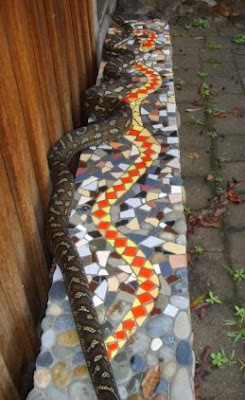 Amazingly, the original snake turned up recently, to meet its mosaic mate!! This photo shows them both together. The full story of the snake can be found here. Also, check out Wendy's website. 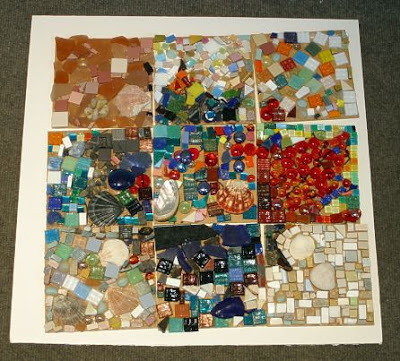 This is the type of mosaic that I love to see submitted to the Mosaic Atlas. 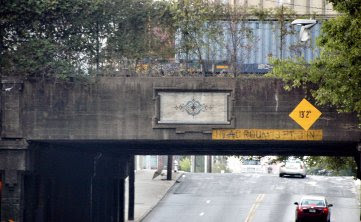 Polly Price sent this photo of a mosaic on a railroad trestle in Atlanta (Hill Street, SE between Decatur St. and Martin Luther). It looks like it's been around for quite a while and I would imagine that hundreds of people drive by it every day but never even notice it. I wonder what its history is. A larger photo can be seen here in the Atlas. Look on page 3.